Growing automobile production coupled with increasing vehicle parc has been the driving the sales of vehicle wash systems over the years. Being the highly populous continent and with rapid urbanization, vehicle wash system market is likely to witness a rampant growth in Asia Pacific over the period from 2018-2026, finds a new Fact.MR study. Gradual shift towards automation from manual vehicle wash systems to maximize profit and deliver high-quality services is anticipated to enhance the lucrativeness of the market. Adoption of washing technologies has been instrumental in reducing high labor costs, which in turn accelerates the vehicle wash system market in the Asia Pacific region. Increasing government initiatives and funding for infrastructural development in emerging economies of Asia Pacific such as China and India are escalating the sales of construction equipment. This is led to the surge in demand for vehicle wash system in these region. Further, automated vehicle wash system has outdone the traditional practice of home washing due to growing demand for repair and maintenance services along with washing. Vehicle wash system industry is focusing on incorporating sustainable solutions growing concerns of environmental issues, which is expected to attract more consumers in the coming years. 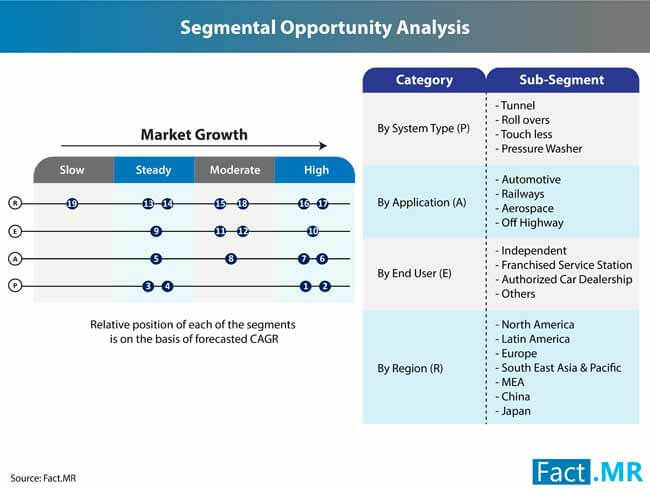 The Fact.MR report foresees the Asia Pacific vehicle wash system market to reach a market value worth over US$ 900Mn by 2026-end, and is segmented into South East Asia & Pacific, China, and Japan. China is expected to dominate the Asia Pacific vehicle wash system market throughout the assessment period, exhibiting an impressive value CAGR of 8.8%. Growing automotive industry in South East Asia & Pacific is further likely to contribute to the growth of vehicle wash system market in these regions. The Fact.MR’s study offers an in-depth analysis and key insights on the global vehicle wash system market over the assessment period, 2018-2026. In terms of revenue global vehicle wash system market is likely to surpass US$ 2,000Mn in valuation by 2026-end, expanding at robust 8.3% CAGR. On the basis of system type, roll over segment is estimated to maintain a supremacy in the market, accounting for nearly 30% of the value share. However, tunnel segment is likely to witness a relatively higher growth over its counterparts. The global vehicle wash system market has been envisaged to remain concentrated in automotive application, with off-highway and aerospace application complementing growth of the market. By region, while the global vehicle wash system market is anticipated to grow significantly in Middle East & Africa, Europe will continue to maintain its dominant position with largest revenue share. Although Fact.MR maintains a positive outlook of the market, high price associated with automatic vehicle wash system is expected to negatively affect the market growth. Further, availability of cheap labor in various emerging market will possibly create hindrance. The Fact.MR report highlights detailed profiles of the key market players participating in global vehicle wash system. They include Coleman Hanna, Aquarama, Ryko Solutions, Inc., Autec, Inc., EHRLE, Aerowash AB, Ross and White, KKE Wash Systems, Alfred Kärcher GmbH & Co. KG, and others.